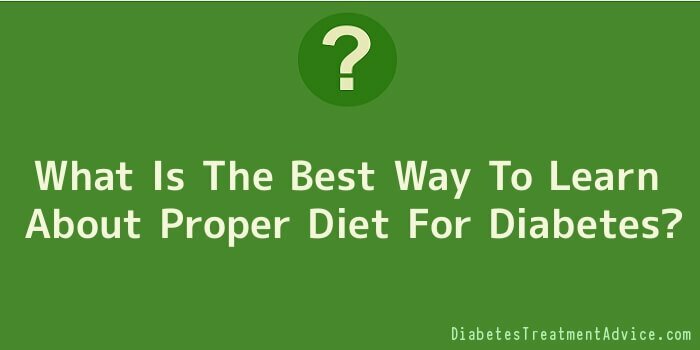 What Is The Best Way To Learn About Proper Diet For Diabetes? One of the worst ways is to use the so-called free diet. Too many people interpret this diet as allowing one to eat any quantity of any food that is available to munch on. With this misunderstanding, caloric intake can range from 1,200 to 4,000 calories, and the blood sugar can range from 40 to 1,000 mg percent. Most people simply don’t do well on unlimited calories. It is much safer to use the weighed diet or the exchange diet. By using either of these methods, you can get a good idea of the approximate caloric intake of most foods. Food labelling and calorie counting books have helped enormously in this regard and should be used as an aid to diet planning. Once you know the approximate caloric intake of the food you eat, you will be able to determine the number of calories you need to get through the day, to keep your weight ideal, or to get through a period of exercise. This knowledge can help you avoid unnecessary extremes in blood sugar levels. Before explaining in detail the exchange or weighed diet, it is vital to know that every person is different metabolically, physically, and emotionally and will thus need a different number of calories per day than another person. It is educated guesswork when a physician prescribes a certain number of calories for a patient. Two thousand calories per day may prove to be too much or too little for a particular person. In such a case, the number of calories will have to be adjusted until the proper amount is determined. This proper amount will be known when the patient has achieved ideal weight and the blood sugar levels are controlled. Understanding a diet depends on knowing some basic facts about nutrition. Let’s review some useful information about food that can help you know whether you are getting the proper daily intake of vital nutrients. A gram is a metric unit of weight. Approximately 30 grams equal one ounce. A calorie is a measurement of energy, scientifically defined as the amount of heat needed to raise one kilogram of water one degree Centigrade. Food contains calories in the form of carbohydrate, protein, fat, and alcohol. It has been determined that there are approximately 4 calories per gram of carbohydrate, 4 calories per gram of protein, 9 calories per gram of fat, and 7 calories per gram of alcohol. With this information and with the help of the federal program which has foods labelled according to their content of carbohydrate, protein, and fat, you should be able to calculate the number of calories in anything from a water bagel to a can of soup to a Pepperidge Farm cookie, and thus incorporate a wide variety of foods into your daily diet. A nutrient is a substance found in food that is essential for proper bodily function. Nutrients include carbohydrates, proteins, fats, water, minerals, and vitamins. An assortment of foods each day is essential for good nutrition. The U.S. Food and Nutrition Board has made recommendations known as the recommended daily allowance (RDA), also known as Daily Values (DV), on product packages, based on studies of nutritional requirements of healthy men and women. From these studies, the board has specified the necessary amounts of each nutrient for proper diet. It is important to remember that these recommendations are for healthy people. Whether they are adequate for patients with poorly controlled diabetes is uncertain.